What separates the marchers from the naysayers? 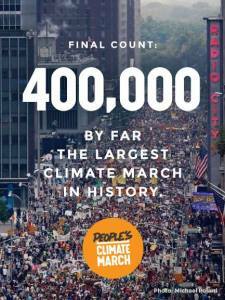 In what was billed as the People’s Climate March, an estimated 311,000 demonstrators descended on New York City in September 2014 with a message of alarm for world leaders gathering nearby at a United Nations summit on climate change. The march attracted leading figures like former Vice President Al Gore and United Nations secretary general Ban Ki-moon. However, as the New York Times reported, it was mostly an event for concerned ordinary people frustrated by international inaction on global warming. But if the marchers were just ordinary concerned people, what set them apart from other concerned ordinary people who chose to stay home? After all, aren’t we all concerned about the health of our planet? Here’s a viewpoint you may not have considered about what separates the marchers from the naysayers. It starts with the theory of global warming, which forecasts a warming planet caused by greenhouse gases released primarily from burning coal, oil and natural gas for energy. Predictions of rising seas and dying polar bears come largely from computer simulation models that are based on global warming theory. If you don’t trust the theory, you probably don’t trust the predictions either. Psychics (intuitive types), especially psychic turtles (intuitive/introverted types), [Review Personality Traits] embrace theory. Experience without theory is blind, they say. This group of visionary and imaginative individuals is focused on the future and gets excited about discovering universal principles. We expect that most global warming scientists and a good many of the marchers are psychic turtles. On the other hand, eagle eyes (sensing types), especially eagle-eyed puppies (sensing/extroverted types), distrust theory. Just the facts, they say. This group of pragmatic and realistic individuals becomes skeptical when they hear words like theory, model, simulation, and prediction. They care about the health of the planet, but they are less likely to be convinced that global warming is real. Eagle-eyed puppies outnumber psychic turtles by more than 2-to-1, and most politicians are eagle-eyed puppies. So, is it any wonder that world leaders are moving cautiously as they wait for global warming to prove itself as fact not theory?